“What she has done will also be told.” And it has been told. Again and again. The story of the woman and the alabaster jar of fragrance is such an extravagant story. From the expense of the nard, to the heavy fragrance of the perfume, I can sense the abundance. Today we are looking at Mark 14:1-9 as the fifth week in Lent. We are using the S.I.M.P.L.E. Method of Bible Study. S – Say the passage out loud: Check other versions. I tell you the truth, wherever the gospel is preached throughout the world, what she has done will also be told, in memory of her (Mark 14:9, NIV). I – Interpretation – Check footnotes, references and commentaries. Find out all you can about the passage. When? Where? Why? 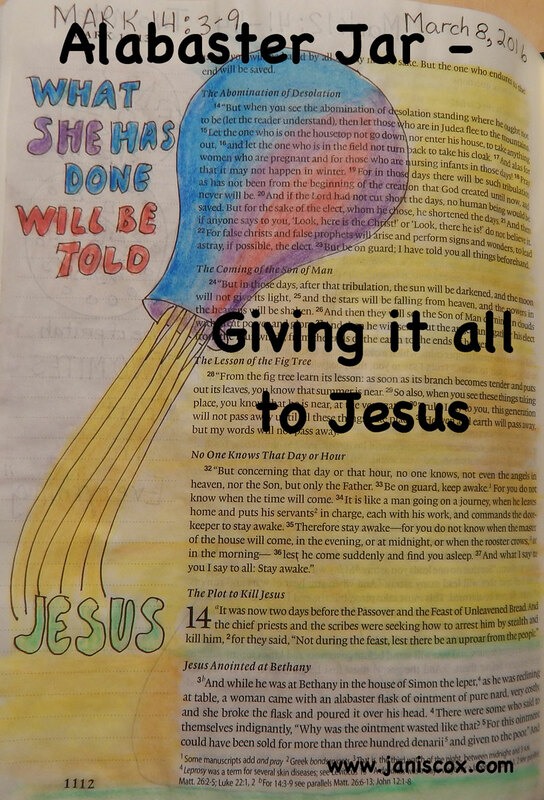 Last week we looked at Mark 12:41-44 where the poor woman put in everything. Looking back at the previous passages we see Passover is two days away. Today’s passage follows Jesus’ description of the “end of the age”. Jesus describes his coming in the clouds with great power and glory. And after this passage – Judas goes to the priests to betray Jesus. Why hadn’t the priests killed Jesus? They didn’t want the people upset. It was feast time. The people might riot. He was in Bethany at Simon the leper’s. Who arrived? And what did she bring with her? A woman entered and brought in an expensive alabaster Jar of perfume – pure Nard. I can find many reports that this was Mary of Bethany, Martha’s sister. But I also found other references that she was an unnamed woman. 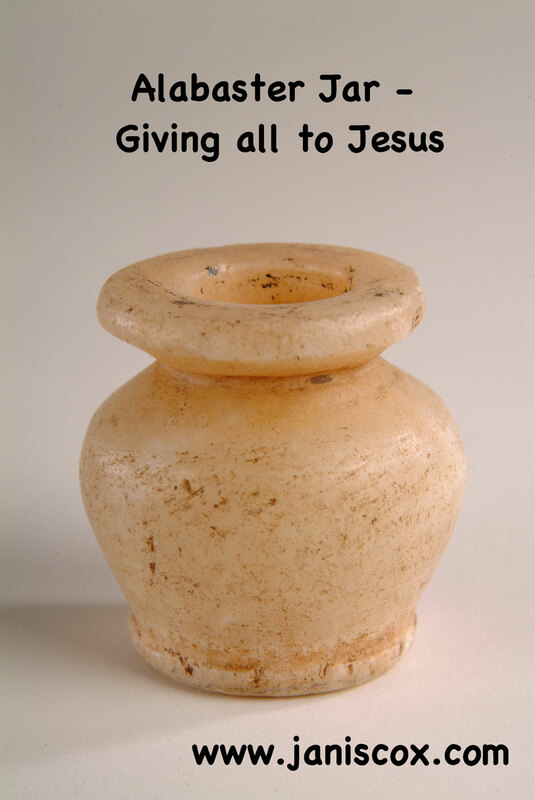 She broke the jar and poured it over Jesus’ head. What was the reaction of the people in the room? They rebuked her and wanted to know why so much money had been wasted instead of giving it to the poor. Jesus told them to leave her alone, not to bother her. He said we would always have the poor but He would not always be here. She did what she could to prepare His body for burial. John 12:3 – This woman has been identified as Mary – and she pours the nard over Jesus’ feet. Nard is made from oil that had been extracted from the root of a plant grown in India. It’s very fragrant. There is so much in this story. Focusing just on our featured passage – the one we will attempt to memorize – Jesus is telling me how important worship is to HIm. The woman has gone to the house with a purpose – a plan. I believe God led her to Jesus to bless Him abundantly. She shows her love and how much she cares for Him. Many stories, articles, and songs have been written about this woman and what she did. It is a small passage but Jesus predicted it would be told again and again when His story was told. And it was and is. Jesus knew exactly what the woman was doing and how much this story would be told over and over. I like to believe it was Mary of Bethany. I remember her sitting at Jesus’ feet, listening to Him and learning from Him. I remember Martha being upset with her for not helping with the preparations. And I remember Jesus saying to Martha that Mary was doing what is best. And once again He says the same thing. P- Pray for God’s Guidance This is a silent time of prayer, listening to God Speak. When you have finished writing all your thoughts, questions and ideas then take time for prayer. L- Life Application – Write down what you heard God speak (no matter how different from your own thoughts previously). Once again I fell asleep. I have been tired lately, fighting allergies. But it was very peaceful and I remember feeling in His arms. Lord, I love how you show me where my focus lies. From looking at the woman who gave everything to the woman who worshipped Jesus fully. I am trying to put my whole self into your Hands. I am trying to cast my cares on You. I am trying to let You show me how to gain more time for Your glory. In Jesus’ name. Amen. Are you frustrated with your spiritual life? Do you want to meet Jesus and talk to Him? Do you need friends to pray and study with together in a safe place? 1. Grow Through God’s Word is a unique Facebook Group — a safe place to dig deeper and be inspired through God’s Word. Click on the image to go to the Facebook Group — answer 3 questions please. 2. Would you like to excite your study of the Bible — Join me for a free Bible Art Course — coming soon? Sign up now. Click on the image to go the Watercolour Sign up. Please follow me on Twitter and on Facebook. This entry was posted in Word of God Speak and tagged alabaster jar, everything, fragrance, Mark 14:1-9, nard, woman, worship on March 12, 2016 by JanisCox. During this 4th week of Lent I have been studying Mark 12:41-44. I have come to the conclusion I need to put everything in His Hands. On Tuesdays I podcast on HopeStreamRadio. You can listen to: Putting it in His Hands by clicking on this link: Here. I have written out the show notes for those who would rather read than listen. Calling his disciples to him, Jesus said, “Truly I tell you, this poor widow has put more into the treasury than all the others. They all gave out of their wealth; but she, out of her poverty, put in everything—all she had to live on (Mark 12:41-44, NIV). I noticed that Jesus sat down at a particular spot so He could see the offerings. He sat down to watch what people were doing – specifically how they gave to God. I read that the offerings were collected in containers that looked like upside down trumpets. As Jesus watched I am sure He thought about all the people as they came into the temple. It says there was a crowd. Hebrews 4:12 tells us that God will judge the thoughts and attitudes of the heart. I try to think – what did Jesus see and hear? He saw a crowd, which is a large number of people. I wonder what their thoughts were? Oh I wish I could keep this. I could really do with a new pair of sandals instead of giving this money to the temple. Oh I think these priests are greedy expecting me to give to them – why don’t they work like I do? Look everyone. Look at my fine clothes. I am helping the treasury more than anyone else here. Look how much I give. Thank You Lord for all You are. I willingly give to You what You require of me. Are these the thoughts that Jesus hears? If so, I have to look at myself. And let’s look at our lives – not just the offering – the money part. Is there anything you are trying to keep for yourself? Are you afraid to give that to Him? Maybe He will know you a little more if you give it up. That way you are giving yourself to Him and putting your life in His Hands. I love the word “cast”. I can see myself throwing my cares over to Him. Hence the picture at the top of the fly fisherman. Can you cast away your cares and let the Lord deal with them? On a personal note, I have been trying to give up control of my hubby for the Lenten season. I don’t always succeed. I think it’s because of habit and because I care about him and want the best for him. But it sounds like nagging when I do it. So once again I am laying it down and asking Jesus to help me not want to run my husband’s life. Father, what we know and what we do are two different things. We know we need to give it all to you but it’s hard when we want to be in control. So today we lay down ourselves and take You up Jesus. We ask You to be the leader, Our Shepherd. We will follow You. In Your name. Amen. Until next time, what can you learn from God’s Word. Make sure You keep reading and keep studying and of course, keep praying and listen to what God has to say. It will be life-changing. Are you putting everything into His Hands? I would love to hear from you. Drop me a note below. It’s always good to be connecting with new friends and old. This entry was posted in Hope Stream Radio and tagged everything, giving, Hope Stream Radio, Jesus, Mark 12:41-44, offering, Psalm 55:22, worship on March 9, 2016 by JanisCox.